Hey y’all! It’s Tuesday again, so it’s time for another peek into my classroom. Last Friday, we celebrated Valentine’s Day. I don’t personally like to celebrate much (the Viking and spent all of Sunday on the couch binging on X-Files…how romantic…), but I love celebrating with my class. We read a short Valentine’s Day book at circle time and talked about who we say ‘I love you’ to in our lives. After we learned how to say ‘I love you’ in sign language, I explained that we were going to make our own Valentines. My students were excited about making their own Valentines, even though most of them had no idea what they were. I explained that Valentines can come in the form of cards, and we were going to print our own at the art table. 1. Fold all the cardstock in half: I wanted the cards to open from the bottom to give my students more horizontal space for writing. 2. Write ‘Love,’ on the bottom half of the open card near the crease: The students were going to practice writing names, so I didn’t want to overload them with work. For older children, they can write ‘Love,’ or a short message themselves. 3. Dent the toilet paper roll a little to create a heart shape: To be honest, it took a roll or two to get it right before I had one that really looked like a heart. It would be a good idea to have a few extra rolls just in case. I only used one because my class size was small, but you can make as many as you need. Set aside until Step 5. 4. Have the students sign their names independently: My students are only just starting to learn to write and recognize letters. I wrote the students’ name on a dry-erase board, so that they could have a reference while writing it on their own. They were able to write with a marker in the color of their choice. 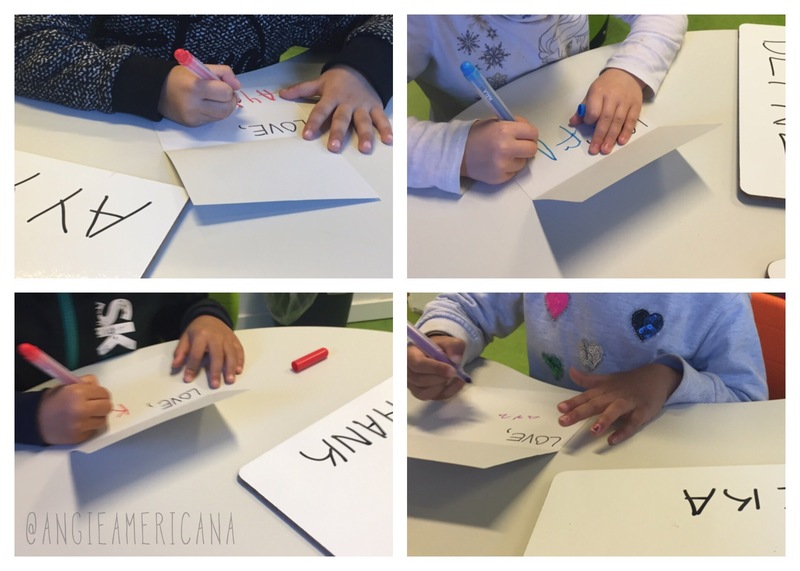 You can have them name the letters as they write them for letter recognition practice as well. 5. Fold the cardstock and have the students use the toilet paper roll as a stamp to create a hearts on the front of the card: The students can dip the toilet paper roll in the paint then press it on the card to create the hearts. Just make sure that they press down on the top of the roll (but not enough to crush it). This will ensure that the print is even all around the heart. 6. Set them aside and let them dry: Congratulations! 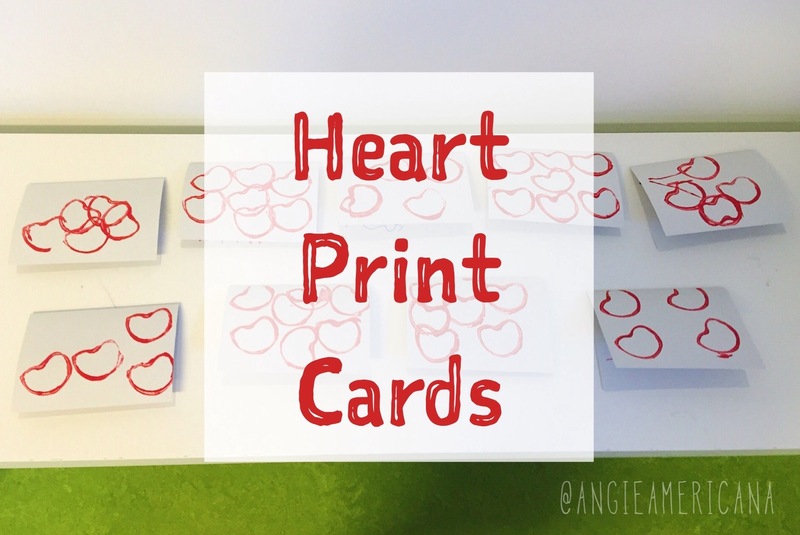 Your students just made heart stamped cards! Have them take them home at the end of the day to give to their loved ones. I know that Valentine’s Day is over now, but you can also do this to make cards for birthdays, Father’s Day, or Mother’s Day! I’m so pleased with how they turned out, and the parents were overjoyed when they saw the Valentines. I definitely plan on doing this again with future classes. What do you think of these cards? Is this a craft you think you would like to try with your class or child? This is such a cute, easy idea! I agree this is great for mother’s day which is coming up soon!